Eco-efficient Value Creation is a method to analyse innovative product and service design together with circular business strategies. The method is based on combined analyses of the costs, market value (perceived customer value) and eco-costs. This provides a prevention-based single indicator for ‘external environmental costs’ in LCA. The remanufacturing of products is an environmental and sustainable approach, in the circular economy, and can deliver lower eco-costs of materials depletion and pollution. From a business point of view, however, remanufacturing seems to be viable in B2B niche markets only. In consumer markets, remanufacturing is less common. The question is how can remanufacturing become a viable business solution for mainstream consumer markets. Traditional ‘green’ marketing approaches are not enough: green has a positive, but also negative connotations, so marketing approaches are complex. By using the Eco-efficient Value Creation method, marketing strategies for the roll-out of remanufacturing in mainstream consumer markets, can be revealed. This approach has led to the development of five aspects, which are key to innovative circular business models, for remanufacturing: (1) buyers differ from the buyers of the ‘new product’ (2) quality must be emphasised in all communications (3) risk must be taken away from the buyer (4) top level service is required to convince the buyer (5) a ‘green’ brand may support the remanufactured product image. A correction to this article is available online at https://doi.org/10.1007/s13243-018-0056-8. Remanufacturing is one of the promising business solutions in the future ‘circular economy’ [8, 15, 19, 27]. Although modern approaches of remanufacturing, as a successful business model, have existed since the end of World War II , it has recently attracted the attention of environmentalists, who propose that it is a way to slow down materials depletion and reduce CO2 emissions. For products, all of which contain energy-intensive materials, remanufacturing can have significantly lower environmental impacts. Indeed, a large contribution towards total environmental impacts of products are related to the extraction and processing of materials derived from primary (virgin) stock materials. This is especially related to the use of scarce or critical materials . Widespread remanufacturing would lower the environmental impact of society. To achieve this, there would need to be a significant increase in the market share of remanufactured products , [5, 23], [6, 3], . Remanufacturing has been defined as: “returning a used product to at least its original performance with a warranty that is equivalent to or better than that of the newly manufactured product” . The disadvantage of this definition is that it is not specific enough to all cases. An example is the return of new electronics products to the on-line store, because the buyer changed their mind (e.g. laptops, tablets an smartphones). These returned products are given a brief physical inspection and software test, and are boxed ‘as new’. Depending on which definition is used, this is ‘reuse’ or limited ‘refurbishing’. This growing business activity is a consequence of modern internet based sales and is not based in the concepts and ideas of the circular economy: it does not lead to a more sustainable society. A more precise and meaningful definition of remanufacturing is: “remanufacturing is an industrial process whereby products, referred to as cores, are restored to useful life. During this process the core passes through a number of remanufacturing steps, e.g. inspection, disassembly, part replacement/refurbishment, cleaning, reassembly, and testing to ensure it meets the desired product standards” . This definition clearly shows that the product is upgraded by a manufacturing process after its use-phase. In the electronics sector (along with some other sectors such as medical devices), this is also called “refurbishing”. The database of the Boston University provides detailed and reliable data on the remanufacturing industry in the USA . An in-depth market study was conducted by the . This study reveals that the current remanufacturing markets are related to production of parts (“cores”) in the following business sectors: aerospace (aircraft components and subsystems), heavy duty and off-road equipment (HDOR) (e.g. Caterpillar), motor vehicle parts, IT parts (predominantly toner cartridges), medical devices (Single Use Devices), and tyres (for trucks and buses). the product is ‘designed for disassembly’. Despite optimistic analyses with regard to the circular economy , the market penetration of remanufacturing is still low. Table 1 shows that the core manufacturing business in the US is still in its ‘classical’ B2B markets of parts for durable products. In these classical remanufacturing markets, only 2% of the products are remanufactured. Data from the UK shows similar remanufacturing market distributions. In the UK the remanufactured ink and toner cartridges is the largest market, followed by automotive, off-road equipment, and pumps and compressors . In Europe as a whole, it is estimated that remanufacturing generates around €30bn in turnover and employs around 190,000 people. While substantial, the intensity (ratio of remanufacturing to manufacturing) is only 1.9%, which indicates ample room for improvement . The technical engineering aspects (the production technology as well as the logistics) of remanufacturing are rather challenging , especially with regard to the fact that the costs must be kept low at a high product quality. Moreover, remanufactured products are perceived by consumers as ‘second hand’ with related performance risks, hence the ‘Willingness to Pay’ is lower than for a new product [22, 33], [13, 7]. Therefore, the profit margin is often squeezed between the low market price and the remanufacturing costs. For B2B markets, where parts are specified and tested, this perceived image problem is lower, since a test can show that the quality of a remanufactured product is equal to the new product. For B2C markets, it is likely that this perceived image issue is the main reason that there are no high market shares of remanufactured products in consumer markets (apart from toner cartridges), compared to the B2B markets. Another reason might be the short lifespan of many product types in the consumer markets: products become obsolete because new products offer more features, improved styling, and increased functionality [1, 43]. The aim of this paper is to explore what can be done to introduce remanufactured products into mainstream consumer markets more successfully, and which new circular business models are required to overcome the aforementioned problems. Business models like Product Service Systems, (PSS) might help [31, 26], but the key question is what kind of PSS has to be applied, in which business case, and why . This paper investigates the following research question: Under which conditions can remanufacturing lead to a business model, which is both environmentally and economically viable? 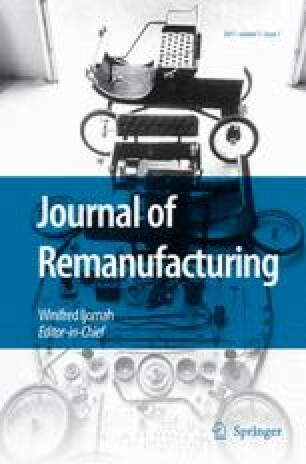 The existing literature on remanufacturing, given in this introduction, highlights that much of the prior research has mainly been focussed on either the environmental or the economic aspects. A combined approach (required for the development of circular business models) is, however, lacking. This paper provides a framework for such a combined approach. In Section 2, Eco-efficient Value Creation strategies are explained, and this approach is applied to remanufacturing in consumer markets in Section 3. The discussion and conclusions are given in Section 4. The research question of this paper is addressed by applying the Eco-efficient Value Creation method in different contexts in order to understand the aspects behind a successful business model focused on remanufacturing. The model Eco-efficient Value Creation is characterised by a combined analyses of costs, market value and eco-costs. In this Section 2.1 a description of the meaning of eco-costs and several meanings of (market) value, as far as it is relevant for the analysis. The two kind of options for product innovation strategies which evolve from the model will be explained in Section 2.2. Eco-efficient Value Creation is a method, developed at the Delft University of Technology, to analyse products and services in order to design innovative products and circular business strategies. The method is based on combined analyses of the costs, the market value (the Customer Perceived Value) and the eco-costs (a prevention based single indicator for ‘external environmental costs’ in LCA). This method is part of the more comprehensive model of the Eco-costs/Value Ratio, EVR . For definitions and concepts of value see Table 2. Eco-costs is a measure to express the amount of environmental burden of a product on the basis of prevention of that burden: the costs which should be made to reduce the environmental pollution and materials depletion in our world to a level which is in line with the carrying capacity of our earth (the ‘no effect level’). The eco-costs should be regarded as hidden obligations, also called ‘external costs’ in environmental economics. The eco-costs have been introduced in the International Journal of LCA , and the system has been updated in 2007 and 2012. For a summary description see: https://en.wikipedia.org/wiki/Eco-costs, accessed November 2016. The eco-costs is the sum of 17 so called ‘midpoints’ (12 environmental and 5 social), as shown in Fig. 1. The value in this analysis is the market value, i.e. the value in the eyes of the customer. In a simple Eco-costs/Value Ratio analysis, the market value equals the price, which is a reasonable assumption for most consumer products in the Western market economy. For the case in this paper, however, one has to zoom in to the level of the consumer, revealing a more complex issue: the perception of the individual buyer. What has to be understood is the relationship between the value, price and cost of successful offerings, see Fig. 2. For definitions see Table 2. In Fig. 2, the difference between the costs and the price is the profit margin for the seller, and the difference between the price and the value as perceived by the customer constitutes the ‘surplus value’. The higher the surplus value, the more desirable the offering. For a commodity product, the price and the value are (nearly) the same (there is hardly any surplus value). The price of a luxury product, however, can be considerably lower than the Customer Perceived Value for the individual customer (the individual surplus value can be rather high). In the case of business innovation, the value can only be determined with some form of consumer research: e.g. WTP inquiries. Entrepreneurs and product designers are commonly faced with this issue, since their activities are directed towards value creation. They use their knowledge, experience and intuition to determine whether their solution creates sufficient Customer Perceived Value at feasible costs, leading to an offering that generates profit for producers combined with a high value for consumers. This Customer Perceived Value (resulting in a WTP) is related to the perception of the product by an individual buyer at the moment of purchase (i.e. the expected fun and use after the purchase) and in the use phase thereafter (which can lead to either increased satisfaction or dissatisfaction) . For some potential buyers in the market the surplus value is positive, for some it is negative (these people do not buy the offering), as depicted with the Gauss curve in Fig. 2. The Customer Perceived Value is determined by the physical and functional product qualities (tangible as well as non-tangible), the service, and the image [11, 9]. The Eco-costs Value Ratio, EVR, combines eco-costs and market value to see whether a product will be successful in the future. The product should have a low environmental impact in its lifecycle (low eco-costs) and must have, at the same time, an attractive value for consumers (otherwise it is not successful in the market). It is a trend in society that industrial ‘free of charge’ pollution, is no longer acceptable . This can be seen in the stricter regulations put onto markets by countries (e.g. tradable emission rights, enforcement of best available technologies, eco-taxes, etc.). Eco-costs will then become part of the internal production costs. So eco-costs are not only a hidden obligation of a company towards the society, they are also a future risk of non-compliance with future governmental regulations. The internalisation of eco-costs might pose a threat to a company, but it might also present an opportunity: when a cleaner product has a lower eco-burden than that of the competitor, the cleaner product can withstand stricter governmental regulations. So the characteristic of low eco-costs of a product is a competitive edge. This leads to the so-called ‘double objective’ (low eco-costs and high value at the same time) of Eco-efficient Value Creation in innovation and design. Examples of this two-dimensional design approach can be found in [20, 45, 46]. its long term market requirement: low eco-costs. Most of the products in mainstream markets have a high quality/costs ratio, which provides the opportunity for the manufacturer to optimise profits: combining a good profit margin with many potential buyers, see Fig. 2 . Most of these products, however, have rather high eco-costs as well. This is the “short term success, long term no market” quadrant 2. The long term risk of these products is the internalisation of the eco-costs : it deteriorates the quality cost ratio, which shifts the product into quadrant 1: low quality/costs ratio, high pollution). This is sometimes a slow process, but in some cases it may happen quickly (e.g. TEPCO Japan, Hummer, Volkswagen diesel), when there is a sudden shift in public opinion, which deteriorates the Customer Perceived Value. Quadrant 1 is not a viable business area: it does not make sense to make low/no profit and pollute the world. Many progressive main stream companies (e.g. BMW, Mercedes, Toyota, Unilever, Nike, Puma) are pro-active: they realise that the way to get out of quadrant 2 is ‘greening’ of their products. The aim is the “long term core product” quadrant 4. Innovative green products are normally in quadrant 3 (“short term, no market”). They are generally introduced by Small and Medium Enterprises (SMEs) . They suffer from a low quality/costs ratio, often because there is no economy of scale, and the benefit for the environment normally goes hand in hand with higher production costs . The issue here is what to do to enhance the WTP of the customers, to enable a higher price at a high volume (see Fig. 2), in order to get into quadrant 4. An important issue here is that the vast majority of people appear to be unwilling to pay more for the fact that a product is green [40, 38]. Enhancing image by means of social media. Last but not least: the negative side of innovative products is the risk of quality (e.g. Is the product reliable? What is market value after x years of use?). This risk is one of the major hurdles to buy innovative products. This hurdle can be mitigated by rental, operational lease, extra enhanced warranties, extra enhanced service . The business strategies for eco-efficient value creation in product innovation, as has been described in this section, cannot be 100% copied to remanufacturing. However, there are a number of similarities, especially in the marketing strategies to bring products from quadrant 3 towards quadrant 4 (Fig. 3). The aforementioned four marketing strategies for green and innovative products (financing, enhancing convenience and image, risk reduction) appear to be quite relevant for the remanufacturing business of mainstream consumer products [22, 33], [13, 7]. Furthermore, the low eco-costs for remanufactured products are difficult to sell. The theory of Eco-efficient Value Creation proposes here the approach of the ‘double benefit’ (as will be described in Section 3). This paper will explore in the next Section 3, what the general theory of eco-efficient value creation means for the successful marketing of remanufactured products. Section 3 starts with “the problem”: the main hurdles of introducing remanufactured products in consumer markets from a value perspective. Section 3.1, 3.2 and 3.3 will deal then with solutions for these hurdles. In the following 3 sections these 3 issues I, II and III are analysed, and consequences for business strategies are explored. People do not pay higher prices (max 2–4%) for green products [13, 21], . However, green brands have a competitive edge in attracting more buyers. This section describes this complex issue. Ottman  was the first who described the opportunities and the pitfalls in green marketing. She introduced the notion of what we call the ‘double benefit’ for the buyer. Ottman distinguishes between the ‘personal benefit’ (e.g. comfort, looks, quality/price ratio) and the ‘environmental benefit’. Ottman realised that most of the buyers regard the environment as important in the long term, however, they buy products at the point of sale on the basis of the personal benefit in the short term. This double benefit marketing is in line with the logic of two experiments at the Delft University of Technology. In the first experiment, the buying behaviour of 3 small groups of people (business managers, consumers and environmentalists), was analysed. The group of consumers and the group of business managers appeared to select their products on the basis of quality and price. Only when there is no preference on the basis of quality and price, environmental issues become important as a final decision criterion. This phenomenon is called the ‘double filter model’ . The conclusion of this experiment is that the environmental benefit does not support the price, but supports the market volume. In the second experiment in 2012, a comprehensive questionnaire on buying behaviour of shoes, was sent to 600 s year bachelor students of the faculty of Industrial Design Engineering, of which 200 responded. This enquiry, which tested 8 variations in advertisements, revealed that a green (environmental benefit) product within a green brand, triggered a much lower buying intention than a product in a brand which were both not green, but both advertised personal benefit only . This result was in line with other experiments with students, that revealed that 50% of the students have a negative connotation of ‘green’ with regard to the personal benefit: these students presume that a product is either more expensive or has less quality when it is green, or do not believe the green claims of the manufacturer. However,  reveals also that a product advertisement, with an accent on quality (personal benefit), within a green brand (environmental benefit), scores the highest buying intention: a double benefit strategy scores the best, see Table 3. It is not expected that this pattern of buying intention of shoes will differ much from the buying intention of other consumer products with a strong correlation with the identity of the buyer, such as garments, smart phones, watches, and even cars. The conclusion for remanufactured products in consumer markets is that the high quality (personal benefit) of these products must be emphazised, to counteract the perceived risk of low quality . Marketing in a green brand (environmental benefit) can support the competitive edge, to attract a maximum market share. The position of remanufactured products relative to the position of new products is depicted in Fig. 4. Although the value of a remanufactured product is higher than a second hand product (the buyer has less risk and gets a better quality), its perceived value (in consumer markets) is considerable lower than the perceived value of a new product. The eco-costs, however, are considerably lower because of lowered use of primary raw materials. This list is obviously fully in line with the list of Section 2.2. It should be the basis of the new circular business models. A typical example of the combined analysis of eco-costs and perceived quality/cost ratio is shown in Fig. 5, the market of refurbished laptops in Europe. Companies tend to depreciate the laptops they bought for their staff in 4 years to zero, hence the book value of a laptop is 25% after the third year. As an example we take the Macbook Pro 15 in. (Retina), price 2100 Euro new, so it is 525 Euro after 3 years. The battery life is 1000 cycles, or 4 years of 250 cycles per year (daily use of the laptop). For companies it is attractive to sell these laptops to a refurbishing company for 525 euro, and give their staff new laptops. For the refurbishing companies it is attractive as well, if they can find buyers for a higher price. The second hand price of such 3 year old laptops in the C2C market is, however, 30–35% percent, so there is a low margin (105–210 euro per laptop). When a higher price is proposed they lose potential buyers in the market, since the customer surplus value is reduced, see Fig. 2. When they offer built-in warranties, offer a good after sales service, and build a strong brand, they can enhance the market value (WTP in Fig. 2) to 55% to even 70% of the price when new (Based on prices in March 2017 from Leapp, Forza, and iUsed, all specialised in refurbishing of Apple products in the Netherlands), resulting in a margin of 630 Euro for laptops with scratches, up to 945 Euro for the laptops which appear ‘new’. Note that higher margins are required here for the service, the guarantees and the image. To summarise; the new Macbook starts in quadrant 2 of Fig. 4 (price 2100 Euro, Eco-costs 144 Euro); it moves, as ‘second hand’ to quadrant 3 (price 630–735 Euro, Eco-costs 36 Euro), and after refurbishment to quadrant 4 (price 1155–1470 Euro, Eco-costs 50 Euro). The refurbishing step is characterised by a relative small increase in Eco-costs (the Eco-costs are still low in comparison to new), and a big increase in price (WTP), caused by the business model which is used. An important reason that an old product has a considerable lower price than new product is that people like to have the latest available gadgets, and the newest designs (often the reason that people sell their product to buy a new one). In modern consumer markets (contrary to B2B markets) products are thrown away or sold because of obsolescence in terms of ‘emotional value’, rather than that they no longer function. This is the reason that, for the time being, it can be expected that the price of a remanufactured consumer product cannot be the same as the price of the new product. This issue is explained, for the case of smartphones, by Fig. 6, which combines the theory of diffusion of innovation  with the costs, price, value model of Fig. 2. Rogers has studied the life cycle of product creations. According to Rogers, there is a small group of people (2–3%) who buy new innovations immediately upon market introduction. This group of people are proud to own the newest and ‘hottest’ products, and are prepared to pay more. As time goes by, they are followed by the early adaptors (12–13%), who analyse first and buy then. These early adopters have ‘respect’ in society, and are followed by the early majority (35%), and then by the late majority (35%). At last a group of laggards (15%) will buy the product when it is cheap, which is the moment sales will decline and the product will be taken out of the market. Smart phones, laptops and other small electronic devices and toys, have a product type lifespan of 4–5 years . Household appliances have a product type lifespan of 7–14 years. Costs are high in the early phase of the lifespan (allocation of R&D costs and high marketing costs), and get gradually lower (economies of scale). It is the nature of remanufacturing that these products come in rather late during the lifespan of the product type. The remanufactured smartphones should be branded as “it was perfect yesterday, it will suit you for another 4 years, since you do not need all the newest features of new phones”. The functional buyer will appreciate the lower price. For the remanufacturer the lower price still accommodates a reasonable profit margin, since a high R&D and marketing budget (more than 100% additional to the manufacturing costs of an iPhone) is not needed. Note that this situation is totally different for the B2B market of Heavy Duty and Off Road (HDOR) equipment (Table 1). In this market, it makes sense that Caterpillar, with its durable, longer life products, remanufactures (i.e. reconditions the heavy parts and replaces the light parts) under his own brand name. In this way Caterpillar underpins the robustness of its equipment, which is a key attribute in the marketing of its new products. Moreover, when Caterpillar can sell these older products at a lower price with a good profit margin, they expand, rather than cannibalise, their own markets. This suggests that the strategy of marketing remanufactured products depends on a combination of the characteristics of the product type and the product itself. For the product itself, the list of 8 characteristics of Section 1.1 is important. For the product type two characteristics are important: the lifespan, and the quality brand (high, medium, low). In general, the non-food fast-moving consumer goods (e.g. garments, plastic toys, cheap gadgets in electronics) are not suitable at all for remanufacturing. A product type must last for at least 4–5 years, like smartphones and laptops. The longer the type lifespan, the more suitable the product type is for remanufacturing. High quality branded products are more suitable for remanufacturing than low cost brands. The simple reason for this is the profit margin of the remanufacturer. High quality brands have high R&D costs and high marketing costs, whereas the remanufacturer has not. Furthermore the remanufacturer benefits from the fact that the OEM applies components with a high technical quality. Last but not least, the buyer regards the OEM product as desirable, so is inclined to buy the remanufactured product, which is affordable. All this leads to a business case with enough profit margin. For low costs branded products the situation is different: R&D and marketing budgets are low, the quality of components is doubtful, and the level of desire of the buyer of such a remanufactured product is low, which leaves no viable profit margin for the remanufacturer. The strategic choices of the aforementioned aspects are summarised in Table 4. For the “no viable remanufacturing business” cases in Table 4, the only viable circular business model is to separate the still working used products and export them to developing economies, in order to give them a second life. Products which are damaged and therefore could be unreliable, must be recycled. This strategy applies to smartphones and laptops which can be shredded/melted down to recover a fraction of the metals in it (e.g. the process of Umicore). This approach applies to many other consumer products. One of the common views is that companies do not remanufacture their products because it would cannibalise on their sales of new products . In Section 3.3 we argue, however, that this argument is not universally valid. On the contrary, there are companies who enhance the quality image of their products by remanufacturing (Caterpillar and its subsidiaries like Jungheinrich) and use their remanufactured products to compete in low cost markets. The assumption then is that remanufacturing has to be done by the OEM (‘closed loop recycling’), but in reality, successful remanufacturing is often done by third parties (e.g. ink and toner cartridges). Apparently there is an enormous opportunity for the circular economy in consumer markets, but the current practice shows that creating viable businesses is hard to accomplish. A significant factor contributing to the lack of penetration of remanufactured products, is the relatively high cost of labour compared to mass-produced new products. Given the positive environmental effect of mainstream remanufacturing, a reduction of taxes on labour and increased taxation on “virgin” materials could be extremely effective by supporting the transition to more remanufactured products. Another driver might come from take-back programmes of OEMs, made obligatory by governmental legislation. The premise that remanufacturing is always good for the environment, since it reduces the overall use of materials, does not hold true in all cases . When the energy consumption of a product in the use phase is high (e.g. cars, refrigerators), remanufacturing should not only address functional recovery and physical appearance. It should also deal with the fact that modern technology is more eco-efficient than technology of the past. Although remanufacturing is one of the key opportunities to lower the eco-burden for a sustainable future, the use of sustainability as a sales argument seems to be rather limited. The marketing of remanufactured products should focus on the personal benefit for the buyer, rather than the environmental benefit. The final conclusion is that remanufacturing can lead to a circular business model which is both environmentally and economically viable. However, careful manoeuvring is required between the costs, all aspects of market value (Customer Perceived Value), and the eco-costs, including the respective communication.